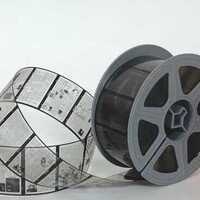 Request for Proposals: "Re-imaging the News"
Artists invited to propose new work incorporating CU Law Library’s archive of NY Times microfiche film from 1970’s and 80’s. Applicants interested in looking at the material in advance can view a sample at the Art and Art History main office VAC 330. Opportunity is open to currently enrolled students in any department at the University of Colorado Boulder. All media will be considered, including sculptural work, hanging installation, wall pieces, and time-based projects. Numerous sites within the Law Library are available for consideration. Site visits will be scheduled with semi-finalists following initial selection. The floorplans for the Law Library is available at the following link: https://lawlibrary.colorado.edu/location-guide-and-floorplan. Semi-finalist will be invited to present their proposals to the jurors and will be given sample materials to work with and will do a site visit. 2nd and 3rd prize work will exhibit their work in a temporary installation at the CU Boulder Law Library for 3-6 months, and 1st place includes a permanent installation. If necessary, modest additional support for material and installation cost may be covered by the Law Library. Slide presentation with 5-10 images of creative work from the past 4 years. Include (title, medium, dimensions) for each image.